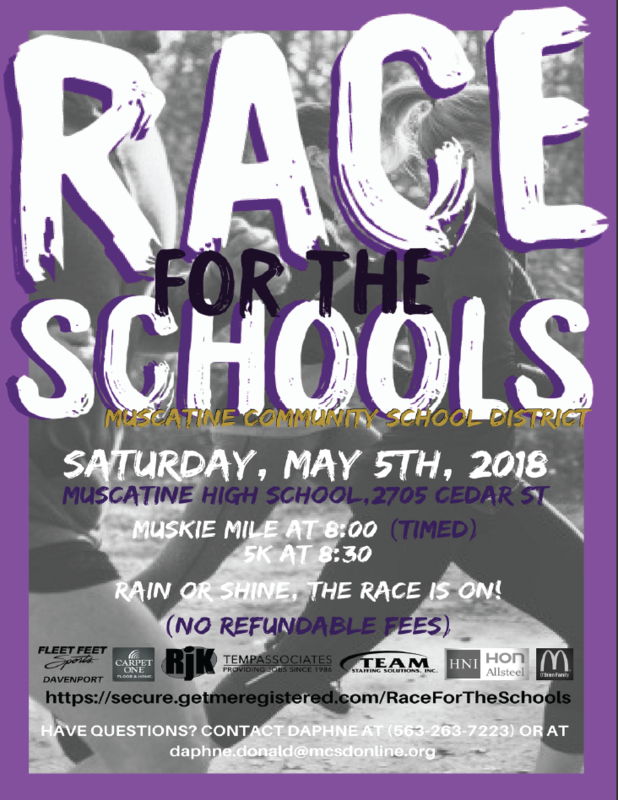 The MCSD Race for the Schools Committee is excited to announce the 6th annual Muscatine Community School District Race for the Schools. The race will be held on Saturday, May 5, 2018 at the Muscatine High School. MCSD Race for the Schools includes a 5K race and a one-mile timed run. Once again this year, student registration fees are discounted 50% and scholarships are available to MCSD students to cover the cost of registration fees. Don’t FORGET the School Challenge! Make sure you list your school when you register! Time: Muskie Mile Timed Run – 8:00 a.m.; 5K – 8:30 a.m.
Funds will be designated to support physical education and student wellness in the Muscatine School District. MCSD PE teachers have been able to purchase equipment for their students including; footballs, soccer balls, Hula Hoops, numbered bowling pins, an ultimate scooter, Rogue Bands, and much more. Race for the Schools also been able to help finance an ice skating trip for middle school students. Muscatine Rocks! and so does this race. 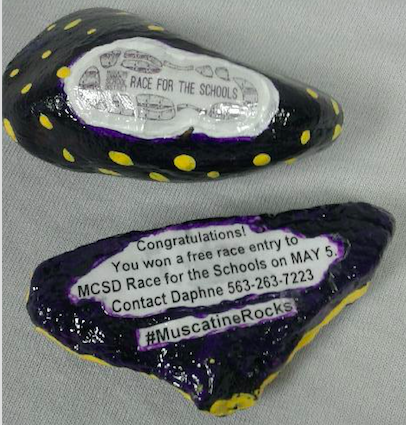 When you are out running or walking, look for a special purple and gold rock – you could win a free entry to the race! !